Presenting can be a real chore, and often technical issues can ruin your flow. Enter the new high-end assistant from Logitech the Spotlight. Powerpoint may not change much, but Logitech wants to reinvent the way you interact with your presentations. The Logitech Spotlight is a simple, intuitive and functional presenter which promises to take some of the blues out of presenting. 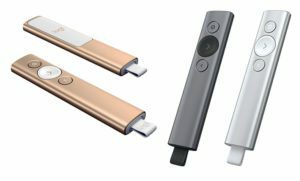 The Logitech Presenter is a slim, sleek, aluminium tube with only three buttons on the front and a rubber insert on the back to keep the Spotlight from slipping out of nervous, sweaty palms. The ubiquitous clicker omnipresent when a presentation is made are often difficult to use, flakey in their actual operation, and have a mind of their own at the least convenient moment. There are only three main buttons on the front top of the Spotlight a large next button in the middle flanked by two smaller back and a spotlight button on top. The Logitech Spotlight has a USB receiver that fits right into the bottom of the tube with a rubber pull tag. The receiver has a standard USB A connector, which will connect to 99% of all PCs you will meet in your various presentations, be that corporate or professional. Hidden inside the Spotlight is a USB-C connector with a cable included in the box for charging. Logitech maintains the one minutes of charging will give you 3 hours of presenting and a fully charged Spotlight will last at least three months. The spotlight has a range of at least 25 meters and can also connect via Bluetooth to make your life simple. Installing the Spotlight is a simple, plug in the USB A dongle or connect via Bluetooth, and the software is downloaded and installed. If the PC is not linked to the internet for presentation purposes, the Spotlight will still install and operate. The Spotlight software does not add great functionality, and the Spotlight can function without any included software, which makes life simple of other people’s machines. The Spotlight software allows two custom actions to the back and next button. These buttons will operate normally if tapped but hold them down and the custom mapping comes in. You can set timers in the software to warn you when you get to five minutes before the allotted time, and this makes the Spotlight vibrate silently in your hand. This I found invaluable for timed presentations, and the functionality worked really well. The Spotlight has a motion sensing air mouse function which is much more useful and flexible than a simple back/forward presentation remote. Hold down the spotlight button and wave the Spotlight about to highlight what’s on the screen. Unlike a little mouse cursor being controlled by the Spotlight, pushing the top button gives you a magnified area of the screen around the pointer, and after a little trial and error, I found this better than a laser pointer and or a mouse highlighter. You cannot right click with Spotlight, this, however, was never a problem when actually presenting. The Logitech Spotlight is simply the most elegant and handy presenter I have used. It takes a few seconds to get used to and operates reliably no matter what PC I plugged the receiver into, be that a Mac or PC. No software was needed, and the Spotlight was a familiar tool that did exactly what it needed to. I no longer had to deal with those blobby and random presenters that are universally supplied. My own Laptop worked with Bluetooth flawlessly and never missed a click from the Spotlight.